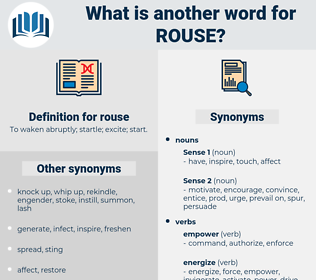 What is another word for rouse? To waken abruptly; startle; excite; start. 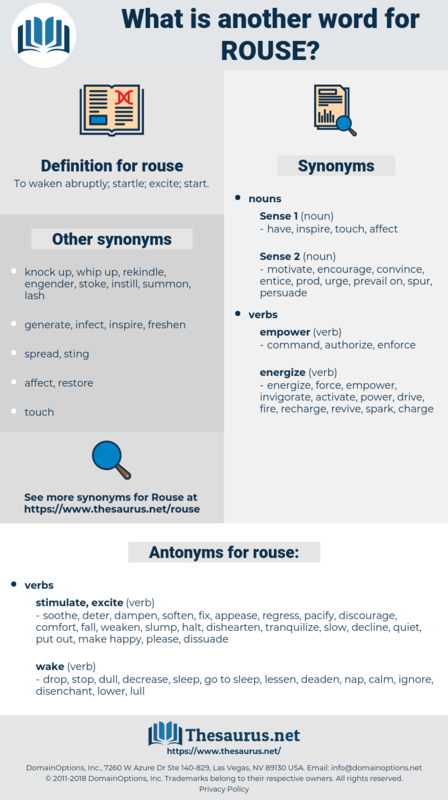 soothe, deter, dampen, soften, fix, appease, regress, pacify, discourage, comfort, fall, weaken, slump, halt, dishearten, tranquilize, slow, decline, quiet, put out, make happy, please, dissuade. drop, stop, dull, decrease, sleep, go to sleep, lessen, deaden, nap, calm, ignore, disenchant, lower, lull. At that he seemed to rouse himself somewhat: his head rolled heavily over upon his shoulder, the lids lifted a little from the red - shot eyes, showing a strange pride when his gaze fell upon the many staring faces. raja, rose acacia, re-echo, ruscaceae, roguish, rework, rye whisky, recess, reich, ragi, reuse, raree-show, rejig, reggae, rejoice, rig, racy, rickshaw, rockies, roccus, rissa, ragusa, rick, ruck, ruse, rachis, reccy, resh, recuse, row house, rhesus, ragee, rousse, rousseau, rhus, rehash, rogue, risque, rickey, resize, rescue, rough-hew, risc, rag week, ruckus, rusk, ruga, raj, riches, rask, rosa, reseau, raze, raise, rorschach, recce, r.c., richea, raceway, risk, rajah, roughish, roux, rise, rachischisis, roughage, rock cake, rough, rough-house, rockchuck, race, rosaceae, roughhouse, rash, rakish, rye whiskey, ross sea, rock, roseau, rich, rook, rugose, rehearse, rush, rehouse, roach, rouge, ras, rosaceous, ross, riga, rushy, rico, ruscus, russia, rococo, rous, reach, rosy, reecho, rage, ricksha, rake, reassess, rice, rhexia, rose, rookie, Rus, rush away, recco, re-argue, risky, Rya Rug, rioja, rug, razz, rack, res, raucous, Rex, rase, rocky, roc, RG, Reyes, resew, rag, reissue, rosacea, rucksack, rao's, reek.